The season is just getting cranked up and the fish are biting. The Seabass and other bottom critters are biting well. The Gulfstream is starting to heat up, and will be getting real good over the next month or so. The annual run of Atlantic Bonito will be happening any time, so call to book your date. Grouper opens May 1st and they will be chewing. The season is here so give us a call to book your day of catching. We have been running non stop here at Bad Habit Sportfishing and have not been able to post a fishing report, so here you go..
Fall fishing is some the best of the year and it is just getting started. The Wahoo, Tuna and Sailfish are biting in the Gulfstream and getting better by the day. The bottom fishing for Grouper, Snapper and other bottom dwellers is getting good too. The large Spanish are making a showing while live bait fishing close to the beach so the large fall kings will not be far behind. The Cobia are starting to trickle down from the north and should be getting good any day as they migrate south for the winter. Book your trip now to enjoy some of the best fishing of the year! I would like to wish everyone a Happy Thanksgiving! The fishing continues to be good. We are catching Grouper, Seabass and large Grunts bottom fishing. We are still catching a few King Mackerel offshore along with a few Wahoo. The Bluefish have been thick along the beach as well as the Grey trout. We have gift certificates available now for Christmas. If you would like one feel free to give me a call. Just as the fishing was as good as it can get, here comes hurricane Arthur and lasting winds. The water clarity has not been the best near shore, however there have been some nice flounder caught drifting live baits on Carolina rigs at the near shore reefs. The kings and Cobia should be biting well this time of year, but with the water turned over the bite has dwindled. There have been a few fish here and there but nothing worth talking about. Historically this has improved once the weather settles down. The Dolphin( Mahi) have been scattered, but when they have been caught it is in 50ft of water out to the stream. Their size is getting smaller, which is normal, as they move inshore. The prime Sailfish bite is getting closer as it normally peaks around August/ September. The bottom fishing has been affected negatively as well, but they are still biting. The better catches of large Grouper are coming from the deeper water around 100 plus ft. With the weather improving daily, I am looking forward to a good fishing report next week! The fishing continues to be red hot as the prime season is upon us. Inshore, there are still a good number of Red fish, Trout and Flounder being caught. We have been catching Cobia and large Amberjack in 50-60 ft of water within six-ten miles of the beach. Look for live bottom ledges and buoys that hold bait. King Mackerel have also been biting within the same water depths which is good news for the smaller boats, who can safely access these great game fish now. Live bait has been the trick for Cobia, Amberjack, and Kings. The dolphin bite continues to be good and there are still a few billfish being caught. The Grouper bite is starting to heat up in the 60 ft and out range. On our half day Spanish and shark trips this last week we have been catching good size Black Tip sharks within a mile of the beach. The fishing continues to be hot, from the beach to the Gulfstream. The Spanish Mackerel and Bluefish are biting well from the beach out to the three mile mark. There have been a few Cobia caught close to the beach and the action should pick up as I write this report. The King Mackerel are still holding in the 70-80 feet of water, but will be moving in closer with the bait in the next couple of weeks. The Grouper and assorted bottom fish are biting from 60 feet and out. Sardines and live bait seem to be producing the most right now. The Dolphin bite continues to be at its peak with the smaller ones being caught within 12-15 miles out and the larger ones in 130 feet out to the break. The Blue Marlin bite also continues to be at its peak and should last for a couple more weeks. We released a Sailfish in the Gulfstream this last week and they should be moving in closer as the bite peaks in July-September. There is a scattered Wahoo and Tuna bite but they are not as prolific as the other species mentioned above right now. Give us a call to get in on the action! Like us on Facebook to view our daily pics, videos and to see what is biting. 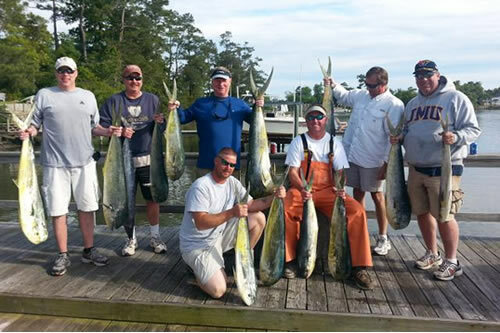 The fishing nearshore and offshore has been good to say the least. We have been catching Spanish Mackerel and Blues close to the beach, and it will not be long before the King Mackerel and Cobia get thick as well, as they move in with the bait from offshore. 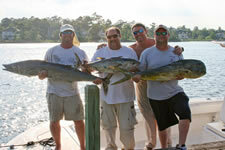 The Kings and Cobia can be found in the 70-80ft depths trolling live or dead baits and spoons. The Grouper and other bottom fish have started biting well from 60ft out to the break. The Dolphin (Mahi) have been biting well from 130ft and out, but we have had some in as close as 11-12 miles or 70ft of water. The Blue and White Marlin have been biting good in 50-100 fathoms or 350-600 ft of water. If you would like to catch a Marlin, mid May thru June is the best time of the year. The fishing is hot this time of year! If you would like to get in on the action give us a call.